Charalambides formed in Houston in 1991 amid a flock of fearlessly exploratory (and often drug-induced) rock bands, when Tom, Christina, and Kyle Silfer put down their beers and picked up their instruments. Eventually Kyle went home to New York, and Christina & Tom assumed the name Charalambides for what eventually turned into a flood of releases- beginning with 1992's Our Bed Is Green on their own Wholly Other label, and continuing with dozens of LPs, CDs, and cassettes on labels such as Siltbreeze, Eclipse, Time-Lag, and kranky. Despite occasional stints as a trio (first with guitarist Jason Bill and then with pedal steel guitarist & vocalist Heather Leigh Murray) and flourishing solo projects, Charalambides remains constant as the core duo of Tom & Christina Carter. From their 2006 & 2007 kranky releases A Vintage Burden & Likeness onwards, Charalambides has renewed their concentration on song-as-mantra (with intermittent guitar solos). But earlier recordings (like 2001's Unknown Spin) whisper of interstellar voids full of silence, or howl with ecstatically-received gnosis (2004's Joy Shapes). 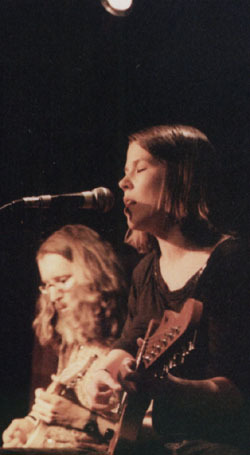 Charalambides' live shows sometimes (and unpredictably) continue this latter thread, which often startles fans familiar only with the band's deceptively low-key reputation. Charalambides began playing sporadic gigs in 1992, making annual or semi-annual forays into other parts of the world from 1993 to 2005 (with the occasional year or two off). In 2006, Charalambides hit the road in earnest, touring the US/UK and making appearances at that year's Terrastock, Arthurfest and the Thurston Moore curated All Tomorrow's Parties: A Nightmare Before Christmas. In 2008, after months of incessant solo and duo touring in the US and Europe, Tom settled in New York City, and Christina went to Austin, leaving touring aside (for a finite yet undetermined period of time) to concentrate on writing and recording. Their upcoming shows in Amsterdam and Hasselt (Belgium) are their first European performances since 2008. Charalambides continue their recorded collaboration with Exile, a double LP of new recordings now available on kranky.